Samsung's marketing team is working around the clock in the days before the official unveiling of the Galaxy S7 and Galaxy S7 edge (cat's out of the bag – it'll happen on the 21st of February at Samsung's Unpacked 2016 event). Aside from posting the Seven Days of Unboxing series on its Swedish YouTube page, Sammy also published a sort of an evolution video on its main Mobile profile. This one doesn't tease the Galaxy S7 per se, it just takes us on a trip down memory lane – from the very first, brick-sized mobile phones, through Sammy's first attempts at a wearable watch phone (the SPH-WP10), the smallest TV phone (looks like the SCH-M2200), the world's first MP3 phone (Samsung SPH-M2500), then through the Galaxy S and Note line, the Gear S smartwatches, and ends at the Gear VR virtual goggles with the caption “Who knows where progress will take us”. So, not much of a reveal there, just some memories in a cool montage. Though we do believe that Sammy's Unpacked 2016 may focus on VR after the announcement of the Galaxy S7 / S7 edge duo. Sources say that it's very probable that Sammy will unveil its Gear 360 camera – a Bluetooth-connectable gizmo, which can take 360-degree pictures and video, and that Galaxy S7 pre-orders will be bundled with a free pair of Gear VR goggles, and — to top it all off — the event itself will be streamed in 360-degree video. So, in light of that information, one could speculate that maybe this is the reason why the video stops exactly at VR — Sammy is emphasizing on the new tech, but could this mean that it's also working on evolving it further? Feb 14, 2016, 8:22 PM, by Paul K.
Feb 01, 2016, 9:06 AM, by Ben R.
If Apple had their way they'd patent troll every other manufacturer info oblivion and keep the same basic phone and O.S for eternity. This is a great video. Well done, Samsung. Great video. But I believe history of mobile devices is incomplete without mentioning also the pioneers; Nokia, Ericsson, Motorola, Siemens, Alcatel or even Nextel. Our world is different since the emergence of mobile phones. 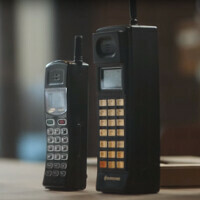 The video is about the history of Samsung, not phones in general. As for your list, no "history of phones" video is ever complete without Palm. Yes, this is about Samsung. Also, your list is horribly incomplete. iPhone was the big jump. I wasn't aware the iPhone was a Samsung model. This is what you understand from my sentence? Very smart!!!! So is thinking the iPhone was any kind of jump :D! Big jump in what? In telling customers what they can and cannot do? It didn't even have MMS. How? Samsung appeared in the Smarphones market after S1 which was a copy of the first iPhone, no? IPhone was the natural progression, as evidenced by both the F700 and the Prada both coming out around the same time. Because Nokia was relying on dustbin workers for their technological advances. Sorry but what is the F700 and the Prada? So you're only aware of what you see on TV a lot...no wonder.